Teachers in the East Bay rallied Friday morning to call for a better and fair contract with the school district. 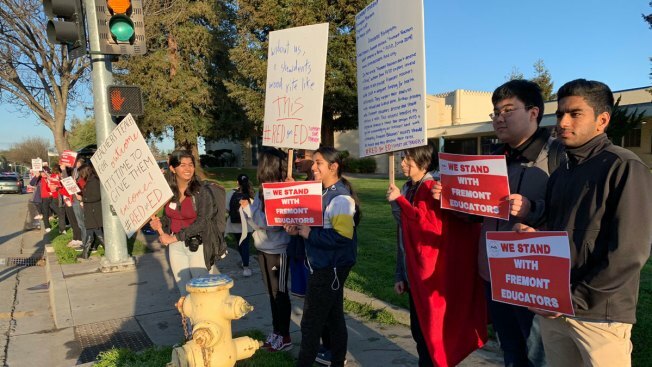 Over 2,000 teachers of the Fremont Unified School District as well as some students and parents held another "walk-in" as educators continue to be at an impasse in contract talks that have been going on since last April. Classes were not affected because teachers protested 30 minutes before the school bell rang in session. "Educators who are commuting four hours plus per day and are worried about their families because they can’t pay for basic essentials simply can’t concentrate on their students as they want to. Investing in educators invests in students," Victoria Birbeck-Herrera, President of Fremont Unified District Teacher Association, said in a statement. Teachers in Fremont and Oakland will join a state-wide educators rally Friday in solidarity with at least 35,000 Los Angeles teachers who are in a contract dispute with the district. Kris Sanchez reports. The district is offering roughly a 5.6 percent raise over three years. The teachers are asking a roughly 11 percent raise over that same period of time. The teachers say they need the 11 percent just to keep up with the cost of living which is really high here in the Bay Area. The district says it would have to make draconian cuts of 28 million dollars just to cover the four percent raise teachers are demanding in the first year. Next week, the contract negotiations will move into a fact finding phase. Similar to what Oakland teachers went throught, a neutral arbitrator will examine both sides arguments and report back the findings. Oakland teachers eventually went on a strike after a fact-finder confirmed what they said they already knew. After a week on the picket line, they came to an agreement with the school district. CLARIFICATION: The previous version of this story cited a report which misstated the school district's counter proposal.